256 pages | 28 B/W Illus. 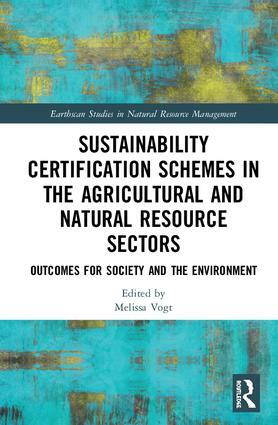 This book provides a balanced critique of a range of international sustainability certification schemes across nine agricultural and natural resource industries. Certification schemes set standards through intra-market private and multi-stakeholder mechanisms, and while third party verification is often compulsory, certification schemes are regulated voluntarily rather than legislatively. This volume examines the intricacies of certification schemes and the issues they seek to address and provides the context within which each scheme operates. While a distinction between sustainability certifications and extra-markets or intra-business codes of conducts is made, the book also demonstrates how both are often working towards similar sustainability objectives. Each chapter highlights a different sector, including animal welfare, biodiversity, biofuels, coffee, fisheries, flowers, forest management and mining, with the contributions offering interdisciplinary perspectives and utilising a wide range of methodologies. The realities, achievements and challenges faced by varying certification schemes are discussed, identifying common outcomes and findings and concluding with recommendations for future practice and research. The book is aimed at advanced students, researchers and professionals in agribusiness, natural resource economics, sustainability assessment and corporate social responsibility. 4. How does FSC certification of forest management benefit conservation of biodiversity? 7. Certifying farmed seafood – a drop in the ocean or a ‘stepping-stone’ towards increased sustainability? 8. Sustainability certification of biofuels in the EU: democratically legitimate and socio-environmentally effective? Melissa Vogt has been involved with and considering outcomes associated with sustainability certifications since 2006. She has experience as a consultant to small and medium sized business in developing countries; and as an evaluator for community-based projects and programs, and for commercialized scientific projects. She has taught in higher education in Rwanda and Australia and is currently based at the University of New South Wales, Australia.